How the home decoration selects the paint for use? 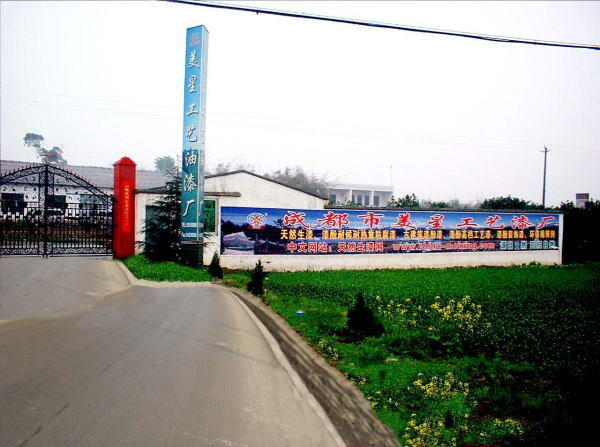 Chengdu City Meixing Technical Paint Factory, it establish on 1984 Annual 8 The moon, floor space 13000 Square meter. Lie to the east of urban area of Chengdu of Sichuan Province of key city of the development of western regions of China, it is the east of new city of future of planning of government of Chengdu, the traffic is very convenient. Chengdu meixing research and develop with China natural lacquer , production and sales, refined to improve with traditional craft and modern science and technology combining together. Our factory , material science of Sichuan university and project institute's professor Huang WanXia, graduate student form partnerships to shake , engage China natural lacquer expert , Professor, the senior engineer acts as a full-time advisor, many professional technicians, have specially set up " the practical technique research institute of natural lacquer ", have inspection technology of improved and advanced science，Practical experience that accumulate for a long time, rigorous degree too of science, make product quality get the assurance; Advanced processing equipment, make product quality improved, the only specialized production base of natural lacquer in China, meixing and the unshakable one , to most basic , most basic research of natural crude lacquer in China and abundant practical experience for many years of old researcher of Sichuan of Chengdu, grind the; heavy antiseptic paint Urushiol able to bear waiting the heat-resisting heavy antiseptic lacquer (heat resistance is 350℃); Urushiol lacquer serial product , make the good result etc，has kept the natural lacquer having peculiar having performance alone , having dispelled the defect, also improved at the same time and is able to bear the waiting , heat resistance, and have no the allergy to the　person . The natural lacquer is a kind of fine natural coating, and a famous local product of our country, have enjoyed the reputation of " king of coating ", the output occupies more than 85% of output in the world, in chemical prevention of corrosion , railway , bridge , vehicle , iron tower of our country , storing the pot , shipping , agricultural machinery , container ,etc., metallurgy, chemical industry, pipeline, large-scale water gate , cooling tower, such structure vehicles of outdoor large-scale steel as the communication tower of telecommunications ,etc., underground project, urban construction, the coal gas is purified, navigation naval vessel, fabrics machine , power plant , mine,, food container, aviation, satellite, war industry civil, wooden furniture , historical relic temple ancient building of the historical relic ,etc., the heavy-duty prevention of corrosion of the mechanical equipment, the prevention of corrosion has played certain protective action and development of national economy in the industrial coating of special type. Whether Chengdu meixing provide for customer high-quality natural lacquer and natural lacquer modify paint serial product. urushiol varnish, urushiol top-grade wooden vessel paint, , Urushiol able to bear waiting the heat-resisting heavy antiseptic lacquer,Urushiol build paint anciently lacquer, Urushiol Nanometer , Urushiol decorate the paint, bodiless lacquer craft paint, food container urushiol paint, urushiol press for and do the pharmaceutical, the paint of dampproof prevention of corrosion of old painting of ancient word, urushiol black paint , , Urushiol surround oxygen corrosion paint , Paint of dampproof prevention of corrosion of old painting of ancient word, the environmental protection diluent . Have sound agent and distribution network in Chinese market, for is it is it is it furnished with colour chip and manual all kinds of to order to serve to sell each, the professional and technical personnel can offer technological consultation to user at any time, before the ones that offer high quality are sold and after-sale service. The sincere Chinese and foreign travelling traders of welcome patronize cooperation! Natural lacquer several getting green environmental protection coating for one year, make us to be common for Chinese nation painting culture reproduce brilliantly long, create beautiful environmental development in order that human and physically and mentally healthy and struggle ! , Professor, the senior engineer acts as a full-time advisor, many professional technicians, have specially set up " the practical technique research institute of natural lacquer ", have inspection technology of improved and advanced science，Practical experience that accumulate for a long time, rigorous degree too of science, make product quality get the assurance; Advanced processing equipment, make product quality improved, the only specialized production base of natural lacquer in China, meixing and the unshakable one , to most basic , most basic research of natural crude lacquer in China and abundant practical experience for many years of old researcher of Sichuan of Chengdu, grind the; heavy antiseptic paint Urushiol able to bear waiting the heat-resisting heavy antiseptic lacquer (heat resistance is 350℃); Urushiol lacquer serial product , make the good result etc，has kept the natural lacquer having peculiar having performance alone , having dispelled the defect, also improved at the same time and is able to bear the waiting , heat resistance, and have no the allergy to the　person . Chengdu City Meixing Technical Paint Factory carries on the investigation scene of natural crude lacquer resources in Yaan of Sichuan.